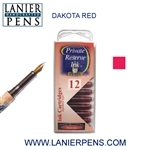 Private Reserve Fountain Pen Ink Cartridges to Create a Lasting Impression. For those who adore writing with the Lanier Fountain Pens then dive into the luxury of perfect fountain pen inks. 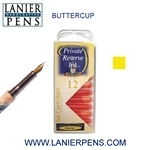 We offer one of the largest varieties of inks for our customers. Choosing your inks are very important because you want to be able to write smoothing and blotch free. If you use your fountain pen on the run or while traveling you probably will not want to be using the traditional bottles of ink. Lanier's offers our customers a very easy way to travel and write with your fountain pen. We offer Private Reserve Fountain Pen Cartridges. Super easy to use because when your pen needs more ink all you have to do is snap a new cartridge in. No fuss and no mess to have to worry about. Work and writing is never slowed down because your fountain pen ran low on ink. Be sure to order a few extra fountain pen cartridges if you will be having a large writing task ahead. For those who prefer to write the conventional way with our fountain pens we offer the traditional bottled ink. All of our inks offered are of the highest quality and will not clog. Keeping your pen clean and writing super smooth is our goal. If you write with your left hand then we recommend our ultra super fast drying fountain pen inks. These inks dry so fast there is no time for smudges and smears to happen. Finishing a writing project can and does happen with fast drying inks.